Quarter Zip Pullover with left front embroidered logo. Available Adult SM - 2XL. Moisture wicking fabric draws moisture away from the skin. Chin saver provides extra next-to-skin comfort. Poly/spandex blend for comfort and stretch. 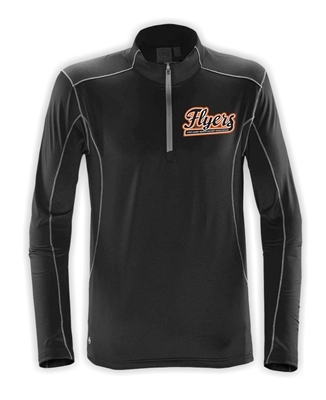 Quarter Zip Pullover with left front embroidered logo. Available in Black/Carbon. Available Adult SM - 2XL. Add embroidered number to right sleeve for $7.00.